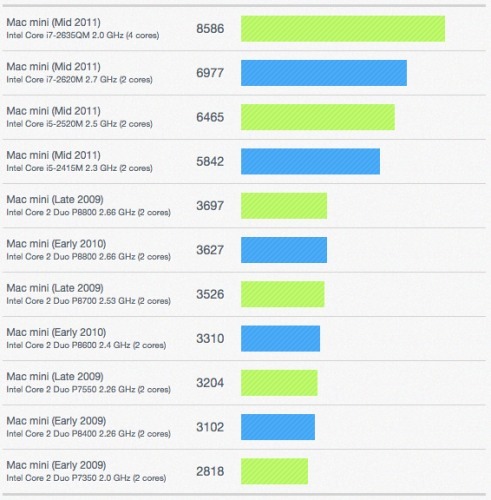 Primate Labs has released their benchmarks for the new Mac mini and MacBook Air. The Sandy Bridge processors in the new Mac mini provides a tremendous boost in performance: the quad-core Mac mini server is 2.3x faster than the previous Mac mini while the dual-core Mac minis are 1.6x to 1.9x faster. Another interesting thing (not shown in the chart above) is that the Mac mini server has roughly the same performance as the entry-level Mac Pro. While this will not hold true after the next Mac Pro update (which is overdue), it's impressive to see Apple's smallest computer provide comparable performance to Apple's largest computer! Like the Mac mini, the new Sandy Bridge processors provide a tremendous performance boost to the MacBook Air lineup: the 13-inch MacBook Air is 1.9x faster than the previous 13-inch MacBook Air, while the 11-inch MacBook Air is an incredible 2.6x faster. 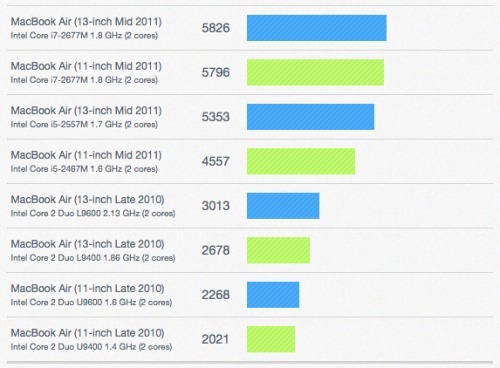 The Core i7-based MacBook Air is almost as fast as the Core i5-based MacBook Pro ( only 20% slower). While there has always been a (sometimes sizable) gap between the fastest MacBook Air and the slowest MacBook Pro, this update eradicates that gap. 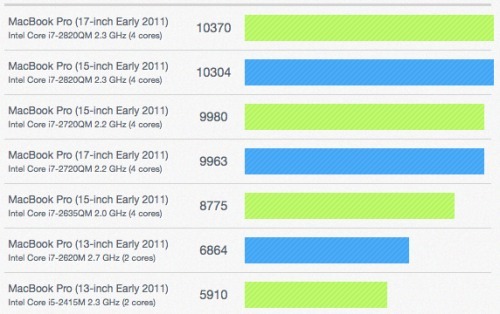 These benchmarks were compiled from the Geekbench browser. You can benchmark your own system by getting Geekbench from here.